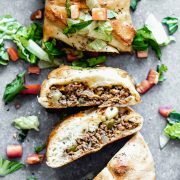 Cheeseburger Stromboli: A super flavorful, cheesy beef filling studded with dill pickles, sweet onions and zippy mustard. 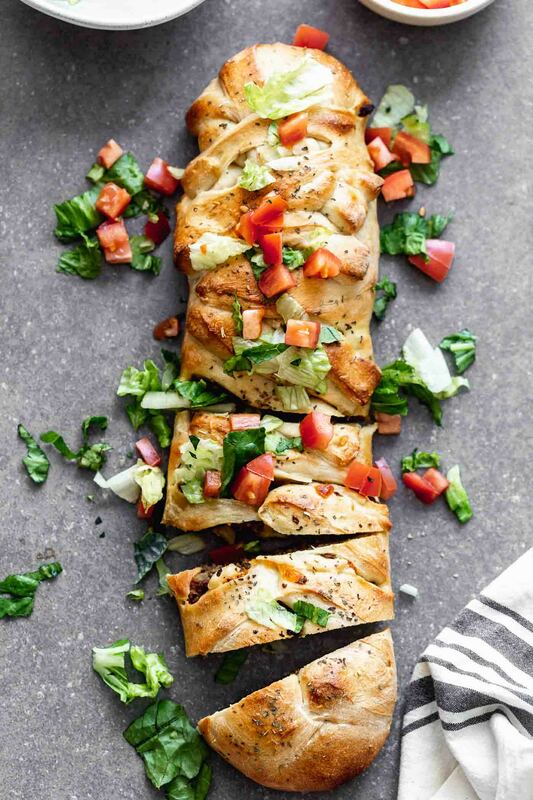 Wrap it up in a store-bought pizza crust, bake and serve! SO good. 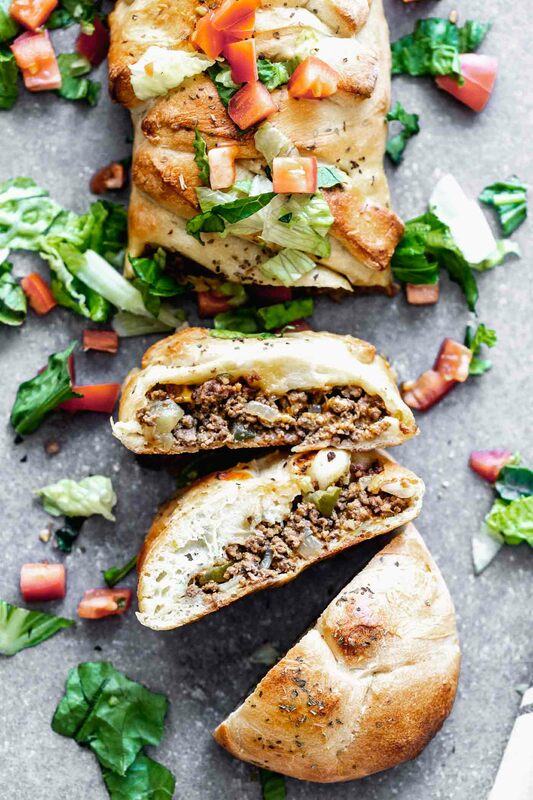 Cheeseburger Stromboli: Because you NEED a break from stuffing, green bean casserole and all things turkey. I mean, I love Thanksgiving fare, but since I’ve been whipping up Thanksgiving recipes since, um, September, I’m ready for a little change. Plus, I still have to eat all of the mashed potatoes, rolls and pies next week, so on to something else! 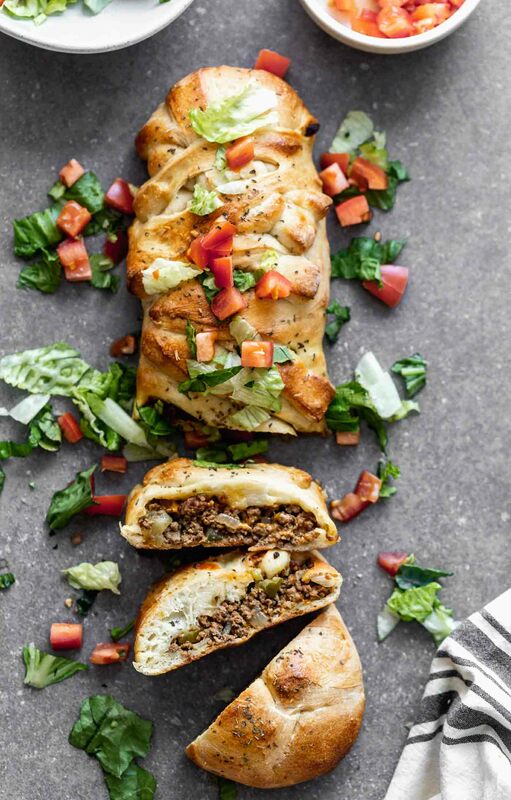 I didn’t grow up eating Stromboli. 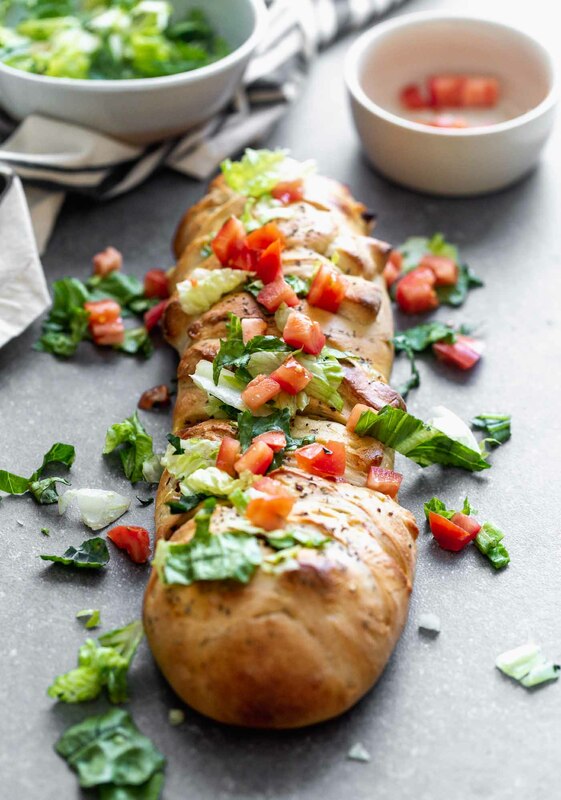 I don’t know why, it just wasn’t something my Mom ever made, and it never really appealed to me when I saw it on a pizza menu, because, I wanted pizza. Duh. I was actually introduced to it by my self-proclaimed non-cook mother-in-law (who is actually a very good cook, even though she doesn’t think so), and completely fell in love. It’s something she makes quite often, and I always look forward to it whenever we go visit Kevin’s parents out east. She makes two versions, one with ham and cheese, and one with spicy pepperoni and cheese. They’re simple, oh-so delicious and I can never choose between the two. My obsession with them, as you can see, has led me to creating my own version, and of course I’m smitten all over again. 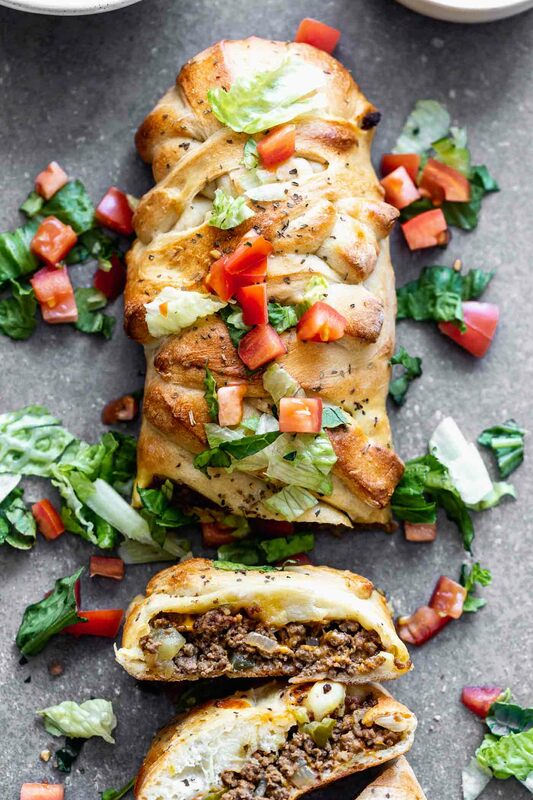 As you can assume by the name, this Americanized version of stromboli is stuffed with a cheeseburger-esque filling, covered in chopped lettuce and tomato and served with ketchup and mustard if you wish. And I kid you not, the filling tastes EXACTLY like a cheeseburger. Ground beef, obviously. I like to use 85/15 fat ratio. You could definitely use ground sirloin or something else as well. Plenty of onion. This is for flavor, but I also love the texture of onion in ground beef. Occasionally if I want a really flavorful burger, I’ll even grate some onion into the beef for grilling. Worcestershire sauce. Essential! I ALWAYS use this when making burgers. I’ll even buy store-made patties, sprinkle them with tons of salt and then drown them in Worcestershire. It adds SO much flavor. Ketchup and mustard. Because what’s a burger without ketchup and mustard?? Chopped pickle. Also an essential part of the ensemble for me. Don’t skip it! Shredded cheese. You can use whatever your go-to is, but I’m partial to a sharp cheddar. While I’m alll about a homemade dough most of the time, here I decided to go with a store-bought pizza crust. It makes things so much easier, and I have no regrets. I used a one-pound package of Trader Joe’s traditional pizza crust and it was the perfect amount of dough to encase the cheeseburger filling. I also tried to be all fancy and braid the dough, which sort of worked. I looked at this “tutorial,” although it wasn’t really a tutorial at all, hence why mine doesn’t look like it. You can try your hand at your own braid, or you can just roll it up jelly-roll style like anyone else. The choice is yours. The taste will be the same. Instead of rolling it out on my kitchen counters or a cutting board, I actually stretched/rolled the dough out right on the silpat on top of the baking sheet. Again, making things easier on myself. There’s no way this whole thing would have transferred from a flat surface to the baking sheet without completely falling apart. 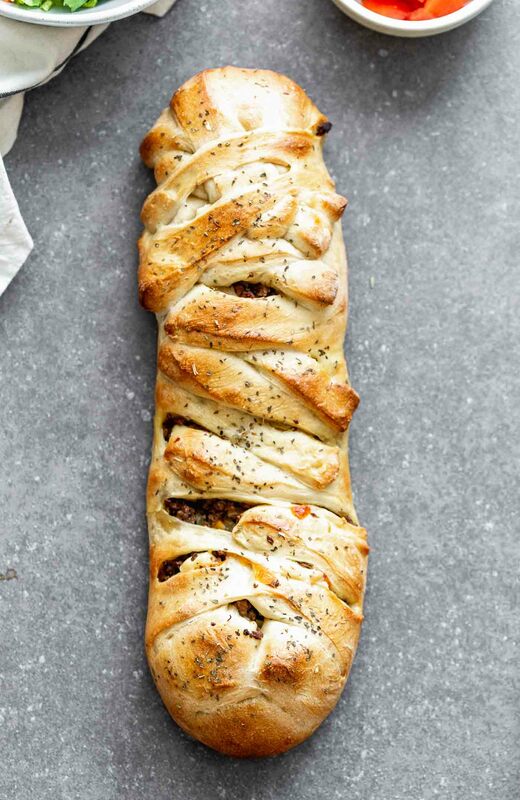 Once the Stromboli is assembled, it’s brushed with egg wash, dusted with oregano and popped into the oven until it’s golden brown and beautiful. And isn’t she beautiful?? Even my failed braid looked gorgeous after baking. There’s hope for us all! Serve with chopped lettuce, tomatoes and your favorite burger toppings! Slice and serve. Preheat oven to 375 degrees. Line a baking sheet with a silpat. Heat a large skillet to a medium heat. Add ground beef. Cook until brown and cooked through. Drain grease. Add beef back to the pan along with onion and salt. Continue to cook until onion is softened, 4-5 minutes. Once the onion is soft, add mustard, Worcestershire sauce and ketchup. Stir until combined. Remove from the heat and let cool white you prepare the dough. Lightly dust the silpat with flour. Roll or stretch the dough into a large rectangle, about 10x18. Add pickles and cheese to cooled filling, stir to combine. Place the filling in the middle, leave about three inches on either side of the filling. If braiding, use a sharp knife to make angled 1-inch cuts all the way up the long sides of the dough, leave the top and bottom alone. (See linked tutorial in notes.) Fold the bottom and top over the filling and then alternate pulling strands over the filling. Brush the top with egg wash and then sprinkle with oregano. Bake for 25-30 minutes or until golden brown. Rest for 2-3 minutes. Cut and serve. Garnish with lettuce and tomato. 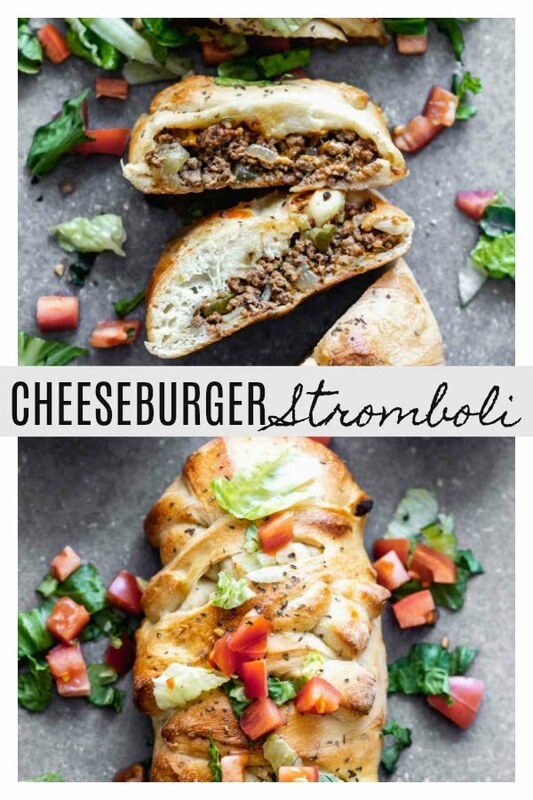 One Response to "Cheeseburger Stromboli"
I’m super excited about this! Looks so delicious!